The men of Rudder's Rangers had a suicidal D-Day mission: knock out the Germans' big guns atop Pointe du Hoc. In the early morning of June 6, 1944, LCA (Landing Craft, Assault) 668 was gliding across the choppy, green waters of the English Channel, transporting First Sergeant Len Lomell, Staff Sergeant Jack Kuhn, and most of the 2nd Platoon, 2nd Ranger Battalion. As the small flotilla of British-crewed craft carried the Rangers toward Normandy, something seemed off. Then Lomell saw it: through the mist and spray, the dark, rocky cliffs of what appeared to be Point et Raz de la Percée came into view. But Point et Raz de la Percée wasn’t their objective. Lomell and his men were supposed to be headed toward Pointe du Hoc instead. Pointe du Hoc sat atop a 100-ft sheer cliff overlooking the English Channel. An important position during the D-Day Invasion, it sat at the highest point between Omaha and Utah beaches. The Germans heavily fortified the area, filling it with concrete bunkers and gun pits. The men of Rudder’s Rangers, the U.S. Army Ranger Assault Group, were given the nearly impossible mission of taking the Pointe from the Germans and taking out their guns. The mission was difficult enough, but the group faced so many setbacks and bad-luck situations that the mission might seem like a comedy of errors, were it not for the intensity of the fighting they endured. Lomell moved across the crowded landing craft towards the British coxswain who was piloting the craft and asked him if they were headed in the right direction. The coxswain nodded affirmatively. From the photos that Lomell looked at during the training exercise, he was sure the 10 landing craft, three DUKWs, and other small boats in Force A were at least two miles off course from Pointe du Hoc and heading in the wrong direction. The operation’s entire timetable was now blown. 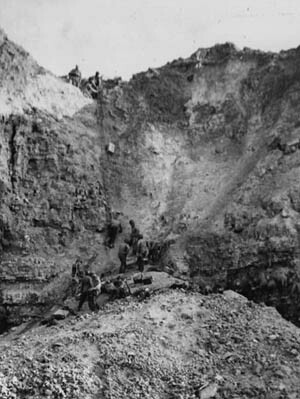 The follow-on force known as Force C—which included Able and Baker companies and some elements of Headquarters Company of the 2nd Ranger Battalion and Lt. Col. Max Schneider’s Fifth Ranger Battalion—would all not be heading to Pointe du Hoc because they never received the appropriate radio signal from Force A. As it was, Force C headed to its second objective, Omaha Beach. Dog Company, along with the rest of Force A, was now on its own and outgunned, heading straight for Pointe du Hoc with no follow-on reinforcements. As rocky a start as this was, it didn’t get easier when LCA 668 finally came near the shore. On board, the loud explosion caused by the coxswain’s firing the grapnel rockets jarred Lomell as he stared at the cliffs of Pointe du Hoc, now looming in front of him. Lomell led the group. As he stepped off the ramp, he completely disappeared from view. A massive underwater bomb crater had swallowed up the first sergeant. The icy water, just 42 degrees, rushed around him as he quickly submerged eight feet below the surface. Bullets pierced the silence underwater as he swam out of the crater and joined the other men, who had avoided the hazard. “Ow!” Lomell then felt a sudden sting of pain through his right side. A German machine-gun bullet barely missed his ribs and went through the fleshy portion of his torso. Not realizing where it came from, Lomell spun around and came face to face with Private Harry Fate. The altercation lasted only a few seconds before Lomell snapped out of his rage and focused on assaulting the cliff towering in front of his men. Minutes later, George Kerchner’s LCA 858 touched down next to Lomell’s boat. Before the craft landed, Kerchner thought about their half-hour delay and felt an overwhelming sense of foreboding. Tags D-Day, DUKW, LCA, Len Lomell, Normandy, omaha beach, Pointe Du Hoc, Rudder's Rangers, US Army, Utah Beach. Has anyone read or know why the guns a Point du Hoc had been removed by the germans? Sorry for my englisch writing…. . They where moved becausse ,half April, 25 A-20 bommers dropt more than 33 ton bombs on Pionte and the guns, some of the guns where damaged. So they moved them out there emplacement ans so to the apple orchard. The guns had been removed to an apple orchard down a dirt road and zeroed in on the beach, soon to be inundated with allied soldiers. Lomell and Jack Kuhn followed the tracks in the road and located the guns, Thermite grenades placed in the traversing mechanism rendered them useless. Saving countless allied lives. Note: The removed guns were replaced with telephone poles. To allied air photography, these appeared as guns. Causing us to expend tons of bombs on the area atop Pointe Du Hoc. leaving the landscape to resemble a deserted moon.